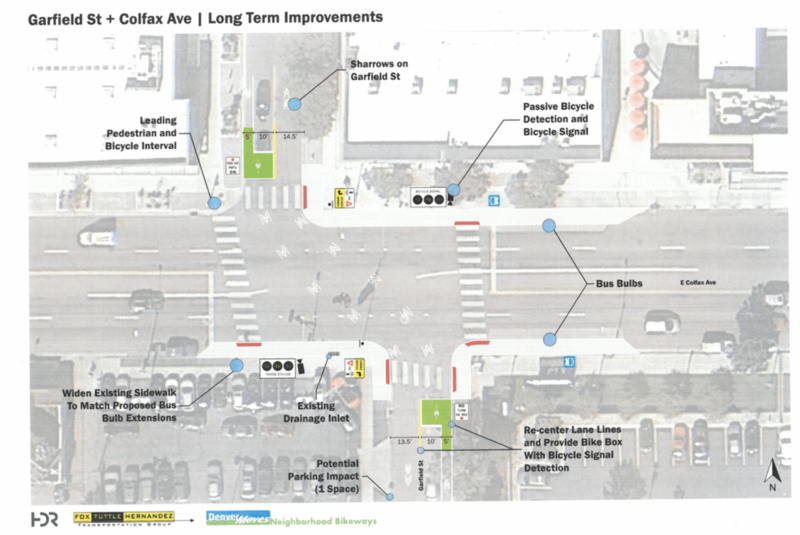 The Department of Public Works is trying to make the city’s east-side neighborhoods better for biking and walking by slowing down traffic and setting aside space solely dedicated to people on bikes and pedestrians. Funding for these projects is uncertain, however. If the projects get funded, they’ll pop up in Congress Park, Cherry Creek, City Park, and other areas east of Colorado Boulevard in the next one to three years. DPW senior planner Dan Raine presented renderings of proposed “neighborhood bikeways” to residents last night at a meeting in Denver’s East neighborhood. The aim is to dissuade drivers from speeding while creating safe bike and pedestrian connections. Some elements, like small traffic circles, signage, removing travel lanes, and striping bike lanes, have a small price tag. Other projects are more expensive, like installing new traffic signals for bikes and pedestrians, building medians, and buying right of way for trails. 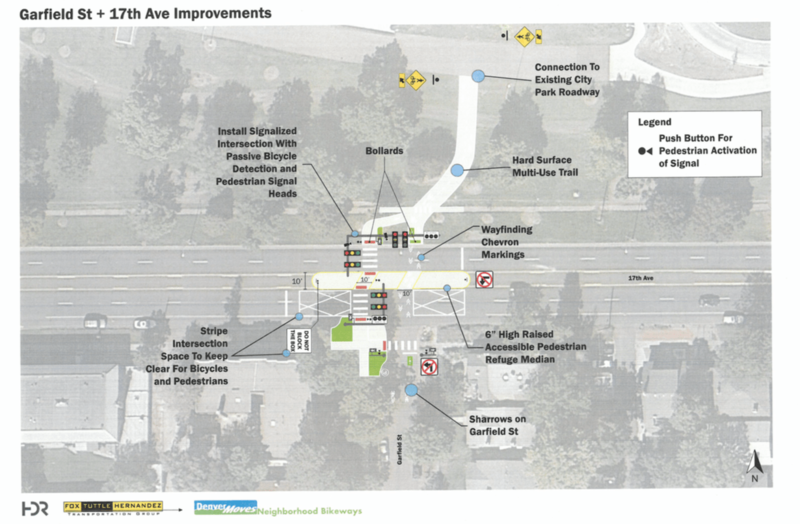 Raine asked residents to prioritize the various projects last night, but the most important — and most expensive — is fixing the treacherous intersection of 12th and Colorado (pictured above). 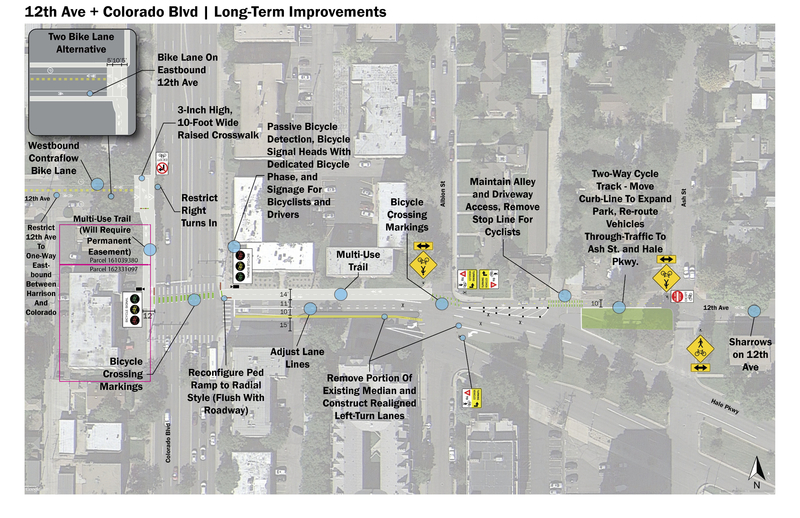 Building a ped-bike trail on East 12th Avenue and connecting it with a bike trail on the other side of Colorado Boulevard would require buying right of way, and construction crews will have to cut up the street to change the traffic pattern. Raine said DPW will have to compete with other city departments for capital funds. 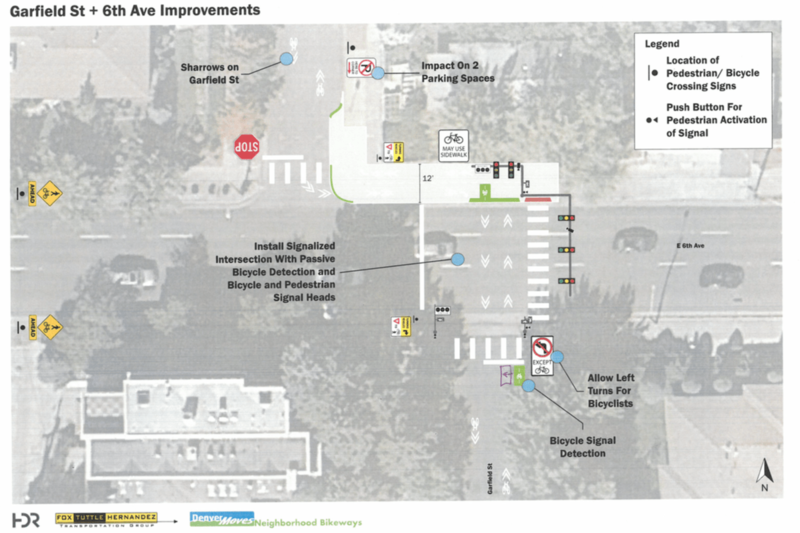 The intersection of Garfield Street, Dakota Avenue, and Cherry Creek Drive North desperately needs improvements too. 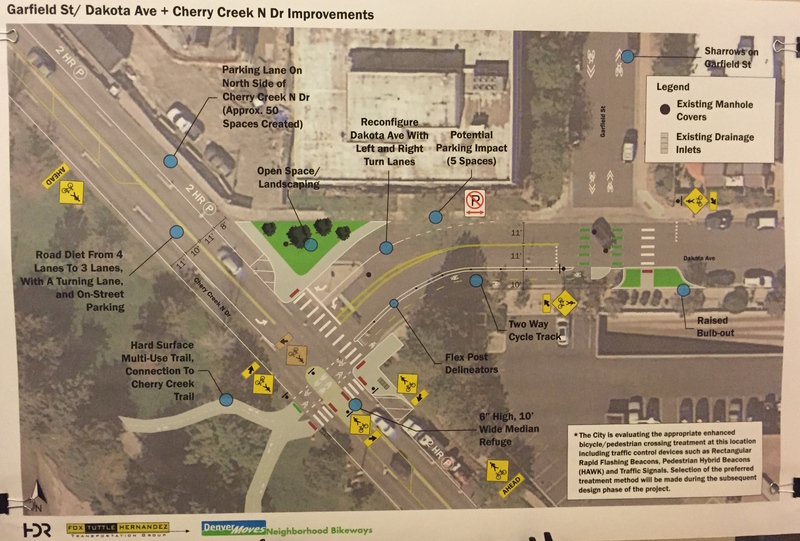 DPW wants to repurpose a southbound lane on Cherry Creek North to carve out space for a long-overdue biking and walking connection to the Cherry Creek Trail. Currently, these streets are designed solely for driving, and DPW’s plan calls for significant infrastructure improvements to make them viable routes for active transportation too. As the Hancock administration and the City Council begin to make decisions about next year’s budget and capital improvement plan, these neighborhood bikeways are the perfect opportunity for elected officials to back up their talk with funding. I was unaware of the meeting and would have attended if I could. But I’m glad to see these proposals and plan to contact my city council member, Mary Beth Susman, and encourage her to support them. Question, though: I live in the East Colfax neighborhood. At an earlier meeting, I raised the issue of Quebec and 12th – those of us who use 12th from the far east side of Denver know what a pain this intersection can be, considering the car congestion on Quebec. Did it get a mention? Thanks! How do projects like this get prioritized and more importantly, how should they get prioritized? It seems to me that we should first prioritize the areas that have the most incidents to pedestrians and bikers, then we should focus on the areas that would have a positive impact on higher density areas with a bias towards lower income. This does not seem to be the case though. Living in Capitol Hill which might be the most biker dense neighborhood in Denver has essentially zero bike infrastructure which seems out of whack.